Salacia Reticulata is a medicinal herb from Ayurveda which appears to have anti-diabetic activities, namely by inhibiting carbohydrate uptake from the intestines; it appears quite effective at this, similar to Acarbose in potency. Our evidence-based analysis on salacia reticulata features 41 unique references to scientific papers. Supplementation of salacia herbs (reticulata or oblonga) seem to be effective in humans when taken at the oral dose of 240-1,000mg, with the higher dose being used more frequently for the purpose of reducing glucose absorption form the intestines. Due to this supplement acting as a carbohydrate absorption inhibitor, it needs to be taken alongside dietary carbohydrates. The Human Effect Matrix looks at human studies (it excludes animal and in vitro studies) to tell you what effects salacia reticulata has on your body, and how strong these effects are. The decrease in blood glucose is acute due to blocking carbohydrate absorption (no studies on long-term glucose influence) and standard supplemental doses range between 20-25% inhibition of carbohydrate absorption, with is quite reliable and significant. The Salacia genus (family of Hippocrateaceae, which has since been incorporated into the Celastraceae family) of plants is a climbing woody plant native to the Indian region, where the species of Salacia Reticulata has a role in Ayurveda as an anti-diabetic herb, particularly during the early stages. The species Salacia Oblonga has also been used at times, and the genus in general tends to be used for other purposes such as treatment of rheumatism, gonorrhea, and skin diseases. The species of Salacia Reticulata is sometimes referred to as Kothala himbutu. In thailand, Salacia Chinensis (also known as Salacia prinoides) has also been used for anti-diabetic purposes as well as a laxative and for relief of Myalgia related symptoms. All three of these plants appear to be medicinally relevant. Other species of the Salacia genus that tend to not be used for medicinal purposes include Salacia Verrucosa and Salacia Hainanensis. At least one study notes poor solubility of the dehydrated Salacia Reticulata extract, which was alleviated with adding cyclodextrins. Salacia Reticulata appears to have the ability to inhibit lipase enzymes and may reduce the rate of lipid absorption after a meal. When tested in vitro, the water-soluble extract of Salacia Reticulata appear to inhibit pancreatic lipase (PL) and lipoprotein lipase (LPL) with IC50 values of 202-393mg/L (PL) and 12-18mg/L (LPL). When isolated components were tested, the most effective (in regards to % inhibition at a set concentration) appear to be some of the green tea catechins (epicatechin and epigallocatechin) as well as 19-Hydroxyferruginol, which inhibited 86.3+/-2.1% of PL at 300mg/L. 125mg/kg of a hot water extract of Salacia Reticulata (suspended in acacia, a gum to slow the rate of intestinal emptying) for 27 days in an animal model of obesity noted a very slight attenuation of weight gain despite no significant differences in calories. A suppression of triglyceride uptake into adipocytes has been noted in vitro during both the induction and maturation phases, reaching about 90% of control at 100ug/mL. Salacia, particularily the Oblonga species, has been implicated in fat burning potential, secondary to supposed activation of PPARα receptors; a mechanism similar to Conjugated Linoleic Acid, but one that may have interspecies differences. In rats, Salacia Oblonga can reduce circulating triglycerides and hepatic concentration of triglycerides while increasing PPARa mRNA and protein content in the livers of Salacia-fed rats. Subsequent in vitro experiements using a HEK293 cell line transfected with PPARα activated signalling via this receptor, and subsequently increased LPL expression; this has been seen in human HepG2 cells as well, and is thought to be mediated via the mangoferin content. No interactions on PPARβ/δ nor PPARγ have been noted in rat myocardium, and in cardiac tissue regulated PPARα by suppressing overexpression; which may confer cardioprotective effects in animal models of metabolic syndrome. Salacia Reticulata has been observed, in vitro in fat cells, that 300ug/mL suppressed adipocyte proliferation by 20% and lower concentrations (10-100ug/mL) hindered proliferation in response to pro-proliferative stimuli; PPAR-γ, C/EBP-α, and Fatty acid Binding Protein (A-FABP) had their mRNA and protein content reduced during day 4 of incubation, with PPAR-γ and FABP mRNA not suppressed on day 8. No suppression appeared to exceed 50% of control, and Mangiferin did not appear to be the active component. One study in otherwise normal male mice given 0.1% Salacia Reticulata in conjunction with either a low (13.8%) fat diet or a high (53%) fat diet noted that, over the course of 9 weeks, that when energy expenditure was measured via indirect calorimetry that mice fed Salacia Reticulata appeared to have a greater metabolic rate over the course of 24 hours, with most significant differences occurring diurnally; the increase in metabolic rate was not quantified. This study also noted decreased weight over 9 weeks in both diet groups despite no differences in food intake between Salacia groups and their controls. 125mg/kg of a hot water extract (Salacia Reticulata) has been associated with a small weight loss in rats, which may have been due to attenuating nutrient absorption. Furthermore, low dose Salacia Reticulata at either 0.3% or 1% of feed in spontaneously obese rats has been investigated for a period of 8 weeks, and without changes in food intake a dose-dependent loss of weight was seen in both dosage groups of obese rats and only the higher dosage group of lean rats (who ate less food than obese counterparts). This study also noted suppression of liver fat and liver cholesterol levels in obese rats only. Attenuation of weight gain in this animal model has been noted with higher doses of 1% and 3% Salacia Reticulata, where the 213% increase in weight in control/obese was attenuated to 175% with 1% Salacia and to 140% with 3% Salacia; weight attenuation in lean controls fed 3% was smaller, 265% weight gain in normal mice to 237% when fed 3% Salacia. The sulfonium sulfate compounds all appear to possess alpha-glucosidase inhibitory properties, and may prevent the absorption of dietary carbohydrates. Salacinol appears to have an IC50 value of 5.2-6uM (maltase), 1.3-1.6uM (sucrase), and 1.3uM (isomaltase); the efficacy of salacinol, relative to acarbose (pharamceutical control) are slightly lesser, approximately equal, and more potent; respectively on these three enzymes. When ingested orally at doses of 0.3-5mg/kg in rats fed a mixed maltose and sucrose meal, Salacinol appears to be able to reduce the serum levels of glucose at higher doses. 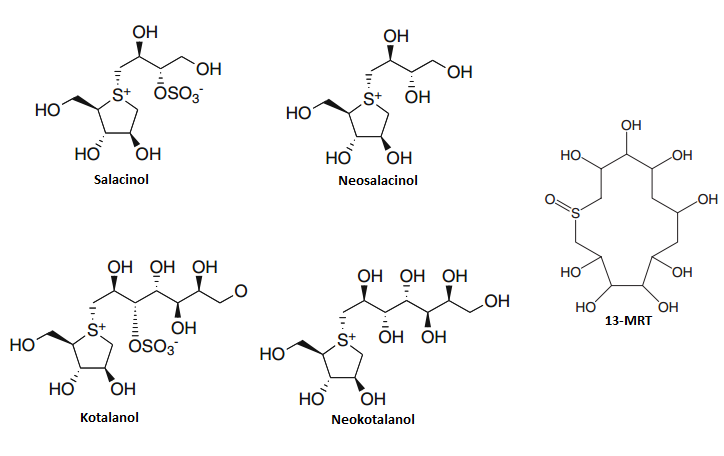 Neosalacinol (derivative of salacinol) appears to be slightly less efficient in inhibiting maltase with an IC50 value of 8-22.2uM, approximately equal with sucrase at 1.3-2.5uM, and more effective at isomaltase with 0.3-0.68uM. Kotalanol appears to be more effective than Salacinol, with IC50 values against maltase, sucrase, and isomaltase of 2uM, 0.43uM, and 1.3uM respectively. Neokotalanol is approximately as effective, with IC50 values against maltase, sucrase, and isomaltase of 1.6uM, 1.5uM, and 0.46uM. Due to the low molecular weight of these molecules, the concentration range of how much of these molecules is required to reach IC50 values tends to be under 1mcg/mL; with the only real expection to this general rule being Neosalacinol requiring up to 5.65mcg/mL for maltase inhibition. The large molecule known as 13-MRT also possesses activity in inhibiting carbohydrate digestive enzymes, with an IC50 value of 0.19uM and 0.23uM against sucrase and maltase, respectively. This compound shows efficacy at doses of 150-900mcg/kg oral ingestion in reducing the spike in blood glucose form a meal consisting of sucrose and maltose, attenuated the spike in blood glucose from a starch meal, and had no effect on a glucose-only meal; it was more potent than isolated Salasinol (1.25-5mg/kg) but weaker than voglibose (100-200mcg/kg). 13-MRT appears to be the most effective isolated molecule from Salacia Reticulata in inhibiting carbohydrate absorption. Finally, Mangiferin (which exists at 0.9-2.3% of the water extract of Salacia Reticulum) appears to also inhibit sucrase and isomaltase (but not maltase) with IC50 values of 87mcg/mL and 216mcg/mL. Mangiferin appears to be the most potent Sucrase inhibitor (with less ability on maltase enzymes), and its content is highly correlated (r=0.934) with the efficacy of the whole plant extract on sucrase. In regards to using the plant extract, Salaca Reticulum root extract appears to be the most effective overall extract. The IC50 value of Reticulata against maltase and sucrase appears to be 89.4mcg/mL and 36.6mcg/mL, which is more efficient than the other two main species. The efficacy of Salacia Oblonga and Chinensis (roots) are 162.1ug/mL and 154.8ug/mL (respectively, against maltase) and 59.8ug/mL and 55.9ug/mL (respectively, against sucrase). The leaf and fruit extracts do not appear to be significantly effective. An aqueous extract of Salacia Reticulata, in rats fed 10-75mg/kg of it, appears to be able to reduce the spike in blood glucose from sucrose or maltose in a relatively dose-dependent manner. One study using the species of Salacia Oblonga noted that, in 66 overweight type II diabetic persons given either 240mg or 480mg of a Salacia Oblonga extract (ethanol and water extract) prior to a sugary meal (maltodextrin, sucrose, corn syrup; 110g total), that the extract was able to reduce the peak postprandial glucose reading by 19% and 27% (240mg and 480mg; respectively) and reduced the 3-hour AUC by 14% and 22%; following this reduction in glucose was a reduction in serum insulin, reducing the peak by 9 and 12% and the 3 hour AUC by 14% and 19%. These benefits have been noted elsewhere in diabetics over time, where consumption of Salacia Oblonga as tea for a period of 3 months in type II diabetics was associated with a decrease in HbA1c by 5.5% (from 6.65+/-1.04 to 6.29+/-1.02), although this was influenced by an increase in HbA1c seen in placebo that was seemingly averted with Salacia tea. Due to the mechanism being related to impaired glucose absorption, these effects are seen in healthy controls as well. One study incorporating Salacia Oblonga at 500, 700, or 1000mg into a meal consisting of up to a third of daily energy requirements and being high carbohydrate in general (75.4g of mostly maltodextrin) noted that the 1000mg dosage reduced postprandial insulin at 120 minutes and the AUC to this point by 29%, and trended towards a reduction in blood glucose by 23% (statistically insignificant). Oddly, peak glucose with the 500mg dosage was increased relative to control, and had a nonsignificantly higher AUC (10.8%). A later study adding insulinogenic amino acids (phenylalanine and leucine) to increase insulin secretion and hopefully reduce glucose came back insignificant, as the addition of insulinogenic amino acids to Salacia failed to be significantly more effective than Salacia in isolation. 500mg/kg bodyweight of Salacia Chinensis (methanolic and chloroform extracts) appeared to exert anti-hyperlipidemic effects in response to triton WR1339-injections (which increase plasma lipid levels acutely), where these two extracts can suppress the increase in triglycerides and lipoproteins with similar efficacy to 10mg/kg simvastin (a statin drug) although trending to be a bit weaker. An increase in HDL-C was seen with Salacia where Simvastin induced a decrease in HDL-C, and both the water and petroleum extracts were ineffective. These benefits were later observed in a diet-induced hyperlipidemic model, where Salacia Chinensis over 14 days at 500mg/kg had the chloroform extract reduce triglycerides (10.1%), LDL-C (29.7%), vLDL-C (18.2%), total cholesterol (16%), while increasing HDL-C (23%) in these rats. At least one rat study has noted the possibility of Salacia Chinensis lowering blood pressure, following injection of a butanolic extract into rats, which appears to be mediated via Nitric Oxide signalling as in vitro incubation with L-NAME abolishes the effects. A hot water extract of Salacia Reticulata tested in vitro in synoviocyte-like cells (as assay for joint cells) noted that it inhibited IL-1β induced proliferation with an IC50 of 850mcg/mL. When used at a concentration of 50ug/mL, the whole extract of Salacia Reticulata abolished proliferation induced by IL-1β. Although not an anti-inflammatory effect per se, proliferation of synovial cells is involved in the pathology of rheumatoid arthritis which suggests that Salacia Reticulata may play a role. It has been noted that Salacia, particularly the Oblonga species, is associated with cardioprotection vicariously through inhibiting angiotension signalling (assessed by in vitro studies on H9c2 cells, where Salacia Oblonga inhibited Angiotension II-induced hypertrophy and protein synthesis) and in vivo has been noted to reduce cardiac hypertrophy in obese rats and a diminishing of cardiac fibrosis. This mechanism, disrupting signalling of Angiotension II and the AT1 receptor, has also been noted in kidney cells and thought to be due to the Mangiferin content. A methanolic extract of Salacia Chinensis appears to be hepatoprotective effects in vitro, where 100mcg/mL of Salacia Chinensis methanolic extract appears to suppress 26% of cytotoxicity induced by D-Galactosamine with significant protection coming from Eleutheroside E2, Dihydrosyringin, and some lignans appeared to be the active components; all were less protective than the active control of silybin (from Milk Thistle). Salacia (Oblonga) appears to exert general protective effects on acetominophen-induced kidney toxicity (during overdoses) secondary to its anti-oxidative effects. One pilot study in persons with diabetic nephropathy noted that, following consumption of Salacia Chinensis at 1g twice daily for 6 months, that the progression of Chronic Kidney Disease pathology (measured by the biomarkers of serum and urinary creatinine, urinary protein loss) was delayed relative to placebo. Rajanyamalakadi is an Ayurvedic combination therapy against diabetes which contains Salacia Oblonga, Emblica officinalis, and Curcuma longa (source of Curcumin) in a 2:1:1 ratio. 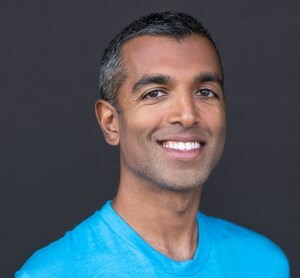 At least one study in type II diabetes where diet was controlled for by a dietitian and medication ceased (under supervision of medical doctors) which intervened with Rajanyamalakadi with individualized dosing noted that, over the course of 3 months and in conjunction with a relatively high carbohydrate diet, that combination therapy exerted anti-diabetic effects. This study divided participants into different groups based on age and baseline fasting blood glucose, and improvements were significant in all groups in regards to reducing fasting blood glucose (range of 14$-17.3%), increasing fasting insulin (range of 43%-57%) and reducing HbA1c (range of 7.5%-26.2%). Beneficial improvements were also seen in lipid panels (reduction of triglycerdes up to 14.3%, LDL-C decreased by up to 22.9% while HDL-C increased up to 13.7%; total cholesterol down in the range of 8%-12.7%) with only two values (HDL-C in the youngest group, vLDL in the group with highest fasting blood glucose) coming back not statistically significant. Decreases in liver enzyes (ALT, AST) and improvements in the artherogenic index were also noted. IP-PA1 is a lipopolysaccharide derived from Pantea agglomerans, a gram-negative bacteria; its given acronym is short for immune potentiator from P. agglomerans. IP-PA1 is also found in apples and pears, sweet potatoes, and rice where it may have a role as an exohormone. One animal study has used a tea made from Salacia Oblonga with 20mg/g fermented flower extract (1% IP-PA1) was compared against a control of Salacia Oblonga tea without the IP-PA1, and in these diabetic mice the Salacia (3mg/kg) and IP-PA1 (10mcg/kg) was slightly more effective in reducing fasting blood glucose than Salacia tea alone, although weight was not significantly different, over the course of 12 weeks. This study also had a human phase, where 47 persons with either high blood glucose (n=14) or high blood triglycerides (n=33) were randomized to Salacia+IP-PA1 tea or Salacia tea (control), and it found the combination tea was more effective at reducing Salacia's reduction in blood glucose in those with high triglycerides but not glucose; only combination tea was able to exert statistically significant improvements in HbA1c, but these were minor after sixty days (2%). One human interventon using 240mg and 480mg of a water/ethanolic extract of Salacia Oblonga noted that side-effects were present but appeared to be limited to gastrointestinal issues (flatulence, abdominal pain, nausea). ^ a b c d e A study on the hypoglycemic and hypolipidemic effects of an ayurvedic drug Rajanyamalakadi in diabetic patients. ^ Antidiabetogenic constituents from Salacia species. ^ a b Aqueous Extract of Kotahla Himbutu (Salacia reticulata) Stems Promotes Oxygen Comsumption and Supresses Body Fat Accumulation in Mice. ^ HYPOTENSIVE EFFECT OF N-BUTANOL EXTRACT FROM STEM OF SALACIA CHINENSIS IN RATS. ^ The Ayurvedic Medicine Salacia oblonga Attenuates Diabetic Renal Fibrosis in Rats: Suppression of Angiotensin II/AT1 Signaling.